Halifax FA Saturday Cup holders Ealandians face a trip to free-scoring Halifax AFL Division Two leaders AFC Crossleys in the quarter-finals of this season’s competition. The Elland side, who play in the Yorkshire Amateur League, will head to Holmfield Rec on December 15 in confident mood after thrashing AFL leaders Midgley United 6-0 away in the last round. Huddersfield Amateur, last season’s beaten finalists at the Shay, face a trip to West Riding Trophy holders Sowerby Bridge in what promises to be the tie of the round. 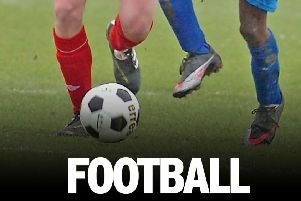 AFL champions Shelf FC will fancy their chances away to Division Three leaders Elland United while there could be a good contest at Ripponden Wood between West Riding CA newcomers Ryburn United and their former AFL Premier Division rivals Shelf United. DRAW: Sowerby Bridge v Huddersfield Amateur, AFC Crossleys v Ealandians, Elland United v Shelf FC, Ryburn United (WRCA) v Shelf United. Matches on December 15 (1.45). Hollins Holme, the Halifax FA Sunday Cup holders. will have to up their game if they are to reach the final for the second year running. The Calder Valley side have been drawn at home to a Siddal Place side who beat them 8-3 in the Halifax Sunday League’s Premier Division last weekend. The other semi-final on December 16 is a heavyweight affair between champions FC Panda and a Waiters Arms side who are also regular contenders for Sunday honours. DRAW: Hollins Holme v Siddal Place, FC Panda v Waiters Arms. Matches on December 16 (11.0).